MuseArts Animation & Cartoons began as an exercise to apply animation skills to the web, and to learn Flash software. We had been looking at Flash as a tool for a few years, but by version 3 in the late 1990’s, it had evolved into something that could no longer be ignored as a tool for 2-D web animation. We also wanted to add to our collection of projects we do for ourselves, building up our library with some cartoons. And as long as we were going to make some cartoons, we set a further goal of doing a series. In the late 1990’s, bandwidth was still an issue for most users of the Internet. Whatever we came up with had to be simple, and the files had to stay relatively small. We hit on the idea of using guinea pigs as serious actors, performing great works of drama. The cartoons would follow simple rules: no dialogue (so they could be enjoyed worldwide), limited guinea pig movements, and actions confined to their cage. Our first cartoon was Prometheus Bound. Lise would help condense the stories and Chris would storyboard and animate them. Working in our free time around paid projects, each cartoon took about a month to complete. The Guinea Pig Theater version of Romeo and Juliet was one of five finalists in the Flash Film Festival in NYC. MuseArts Animation & Cartoons now has a vintage FAX Jr. animation stand, Canon Rebel T3i, Nikkor lens, and single frame software from Dragonframe. New projects will include pixilation, stop motion, time-lapse, and object animation using mixed media. 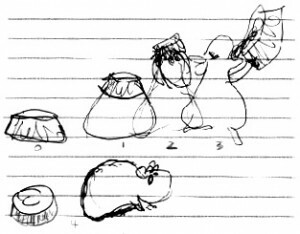 Here they are, in all of their original Flash glory: animated guinea pigs performing classic dramas in their cages. You can also find these on YouTube.